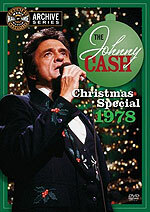 DVD reviews: "The Johnny Cash Christmas Special: 1978" and "The Johnny Cash Christmas Special: 1979"
These reviews first appeared in Turbula in December 2008. Following up last year's release of Johnny Cash's 1976 and '77 Christmas specials on DVD, Shout! Factory is issuing two more of the annual TV shows the country legend hosted after his regular variety show went off the air in the early '70s. The 1978 show moved to Los Angeles, and in so doing lost some of the charm evident on the first two DVDs, which were filmed in Tennessee, where Cash and his wife, June Carter Cash, lived. The Southern California show did benefit from the presence of then-married couple Rita Coolidge and Kris Kristofferson, then at the top of their popularity. Steve Martin's comedy bits seem dated today, though. Having Andy Kaufman, in character as Latka from the TV show "Taxi," as the comedy relief gives the 1979 show a big boost, as did returning the annual show to Tennessee. Kaufman's jaw-dropping impersonation of the recently deceased Elvis Presley is so spot-on, and so outside the realm of Latka, that it might leave you with your mouth hanging open in wonder at his ability to shift gears. Tom T. Hall and Anne Murray are the musical guests, and Johnny also visits his childhood home in Dyess, Ark., with his father and older brother. Both are fun shows to watch, with some great musical performances.